As lion is working in his garden on autumn day he notices a little injured bird and decides to help the little creature. For the duration of autumn and all through winter, the lion cares for the bird. He tends to the bird’s injury and shares his home, food and even his hat throughout the cold winter months. As spring returns, so does the birds flock. The lion sadly, but stoically, bids his new friend farewell and spends the rest of the spring, summer and early autumn quietly tending to his home and garden alone. The autumn winds bring colder weather and the faintest hope that perhaps the bird will return to spend time with the lion and, much to the lion’s delight, the bird does return to his friend. This gentle story of friendship and kindness is impeccably composed by author and illustrator Marianne Dubuc. Minimal text provides for numerous opportunities to engage little ones with questions about emotions, seasons, and predictions of what is to come. Dubuc’s soft, endearing illustrations not only compliment the text, but also further the story seamlessly. Additionally, the clever use of blank pages quietly denotes the passage of time and accentuates the spot on pacing of the story. One particularly outstanding instance of storytelling occurs when the lion is hoping for a return visit from his feathered friend. An initially crestfallen lion is followed by two blank pages. Then a single music note then appears to fly into the page, signifying the bird’s homecoming, and is followed by a wordless two page spread illustrating the reunion. It is pure happiness! This charming and gentle book would be a lovely bedtime story to share with young children ages two and up. This month, Kelly shares Parrots Over Puerto Rico by Susan L. Roth, a fascinating, picture book-length history of both Puerto Rico, and the parrots that live there. You probably have deduced from the title that this book has a pet with questionable health and are ready to move on to the next review because you don’t like sad stories about animals…but please don’t! This is a certainly a story that features a very sick cat, but also manages to be a feel good story, a slice of Oakland, CA urban life, a sweeping fairy tale, a love story, and realistic tale about a 10-year-old girl navigating her world. Oona copes by telling whoppers; so many whoppers that she has a color coding system for all of the different types of whoppers she tells. The best whoppers are the stories she creates for Freddy. 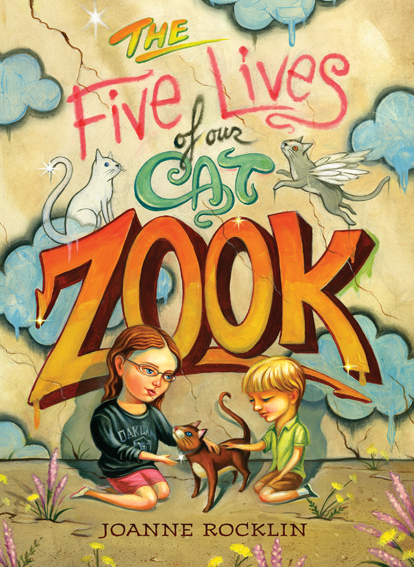 Fairy tales that are crafted from memories their father told her that help explain the world to a 5 year-old, including the four lives prior to the one that their cat Zook is currently living. Oona’s whoppers get her into some trouble, but they also make her and Freddy’s life much more bearable and the beauty of this book is watching how those whoppers eventually help her family move on from very tough times. We have to experience some sorrow to find joy and this book is a perfect example of that. Knowing what to say in any given situation can be tough. You may be in a difficult situation and need to speak with care so as to avoid hurting someone’s feelings. You may be dealing with a bully and you need to stand up for yourself. You may need to respectfully negotiate a compromise with a friend or parent. And sometimes you hurt someone and need to apologize. 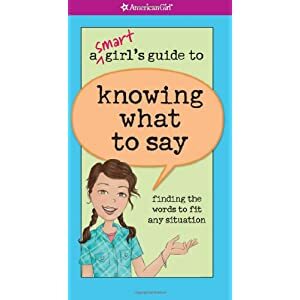 A Smart Girl’s Guide to Knowing What to Say covers all types of situations and offers real-life examples of healthy ways to express what you mean effectively and with respect for yourself and others. This is a great book for girls to explore on their own or with their parents or friends. It would make a great starting point for discussion or a guide to role playing between daughters and their parents, so as to practice handling different situations. The information in this book is well organized and the design is colorful and appealing. It is part of the American Girl series, which many girls may already be familiar with. The book was made for girls, but it is sound advice for boys as well! A Smart Girl’s Guide to Knowing What to Say was first recommended to me by the organization A Mighty Girl – check out their website or follow them on Facebook for great book, toy, and movie recommendations for girls, as well as interesting information about women throughout history. Everyone knows a child or has been the child that doesn’t get noticed in school for one reason or another. 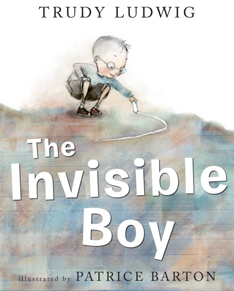 This book perfectly illustrates the world of a child who feels invisible. The teacher is so busy dealing with the boy with the “volume control” or the girl who complains and whines too much that she too doesn’t really notice Brian. He doesn’t get chosen for teams at recess and doesn’t get invited to parties, and sadly the other kids don’t stop to notice that their actions may be hurtful to Brian. No one seems to notice all the good things about Brian – that he is a wonderful artist – that he has a great imagination – that he can write exciting stories . . . Then one morning a new boy arrives in class, and Brian shows him a little kindness when the kids tease the new boy about the strange food he is eating for lunch. When the new boy Justin finds Brian’s note telling him that he thought his lunch looked good, Justin thanks him, and the two become fast friends. AND once Justin takes a chance on Brian, other friends follow, and pretty soon Brian doesn’t feel so invisible. Thanks to Miss Judy for pointing out this beautiful story to me. It is a must read! With the summer reading club in full swing, I have books about pets and animals on my mind. The latest Fly Guy book was the perfect summer find. We have always enjoyed the other easy readers from this series in our house. And now, Fly Guy is making his picture book debut. In this latest story, Fly Guy is disappointed to discover that almost everyone has a pet except him. His owner and best buddy, Buzz, take him to the pet store to find a suitable pet. Unfortunately, none of the animals are quite right. Especially the frog that tries to eat him! It turns out that his buddy Buzz makes the perfect pet. Buzz accepts the offer to be his pet as long as Fly Guy doesn’t feed him. This is a cute story with a fun ending, and even has a nice introduction to the basics of pet care thrown in.